Crouse-Hinds Condulet® 1-Gang Deep FDCT device box features feraloy iron alloy construction and electro-galvanized/aluminum acrylic paint finish. 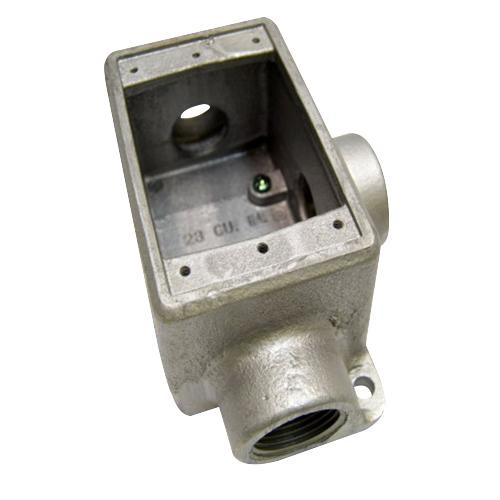 It is suitable for use with threaded rigid and IMC conduits. Box has three hubs of size 1-Inch. It measures 4-3/4-Inch x 6-9/32-Inch x 2-11/16-Inch. Surface mountable box offers access to conductors for maintenance and future system changes. It comes with cover for flush mounting extend to conceal the rough plaster line. Box is UL listed, CSA certified and meets ANSI standards.